Church of the Big Sky: PostSecret: the Book - have you bought your copy yet? PostSecret: the Book - have you bought your copy yet? Most visitors to the Church of the Big Sky know that my Sunday night addiction is PostSecret.com, the art project where people anonymously share their secrets on the backs of postcards. Each PostSecret postcard tells someone's story – a hope, a dream, a fear, a sin – and is art and confession and catharsis, all at once. Start reading, and you'll get hooked, I guarantee. 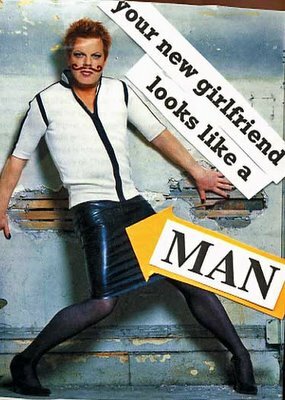 A sample of what you find at PostSecret.com. This was my favorite card in the most recent update on Sunday. The creation of Frank Warren of Germantown, Maryland, PostSecret has become a global Internet phenomenon, fascinating, touching and amusing people around the world with each week's fresh thoughts. Time.com named PostSecret one of it's 50 Coolest Websites of 2005 and Technorati lists PostSecret.com as the second most popular blog in the entire blogosphere (exceeded in popularity only by Boing Boing.) And, this week saw the release of PostSecret: Extraordinary Confessions from Ordinary Lives, a hardcover collection of hundreds of the thousands of cards Frank has received since he started the project in the autumn of 2004 as his contribution to DC's acclaimed Artomatic event. The cover of the book. Very cool in its simplicity. Frank has kindly offered to answer some questions for me about the PostSecret book and the PostSecret phenomenon. He is one busy guy though - along with the book (and his day job and his family and general Life Stuff), Frank is busy preparing for his next PostSecret exhibition in Georgetown (sponsored by the Washington Program for the Arts/Corcoran, December 15 – January 6), so we may have a wee wait for those answers. In the meantime, I asked Frank if he had any favorite websites or blogs to recommend to folks and he says he likes these guys: FOUND and the Wooster Collective. PostSecret: Extraordinary Confessions from Ordinary Lives is available now. First week sales are very, very important, so, if you love PostSecret and want to help Frank keep the project going, hie thee to Amazon.com or one of these fine purveyors of the written word (and altered postcards) and buy a copy for yourself and one for a friend. You never know – you may find yourself somewhere in those pages. you totally beat me to it, but I'll still probably post about it tomorrow. go Frank! 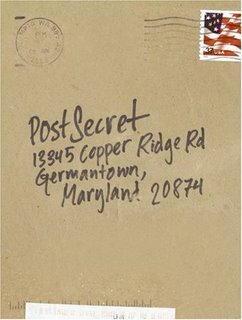 PostSecret is a real unique thing - Sometimes I get lost in all the secrets so I try not to go there too often. Cool site. Thanks for the link. Always: Go Frank, indeed! Do write something about him and the book - this is a great project and if we can encourage him to continue, all the better!! Rarity: I can't help myself. I'm there every Sunday, checking in. Claire: It really is cool. Sometimes, I'm not sure if I should laugh or cry.